In most sectors of the design industry mock-ups are commonplace. They allow in situ testing of colours, materials, spacial reasoning, lighting effects, usability and so forth in a scale simulation of the final design with an opportunity for feedback to iterate and refine the design. Although worthwhile, they can often be expensive and time consuming for the overall project. Cue the Protopiper. Created by a team at the HPI Human Computer Interaction Lab in Germany, the device acts as a mini handheld assembly line. It draws tape from a roll, shapes it into a tube, seals it, and cuts it off with a wing connector allowing you to join endless pieces together. 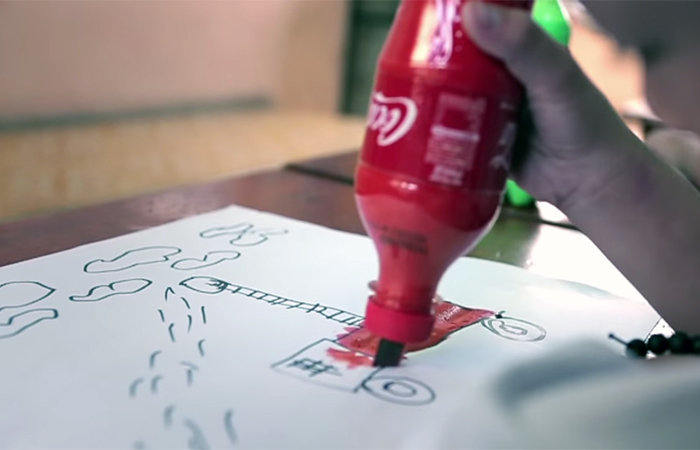 Innovation sometimes sits between AutoCAD and balloon animals. What might have easily have started out as a joke down the pub is actually a very cleverly detailed piece of kit. It allows for very quick and very cost effective mock-ups of, well, almost anything that you can think of! Being able to “air sketch” 1:1 scale objects in real space would be an invaluable tool for many architects, interior designers, space planners, and designers in general. It’s like wireframing in real life. Ok, so it’s not 100% perfect. But it does have appeal with an almost whimsical and crafty element to how it looks and performs (as a hacked tape dispenser) that can effectively draw and build ideas in real time. It’s not always about being perfect but often more getting a feel for something, which the Protopiper achieves rather well. 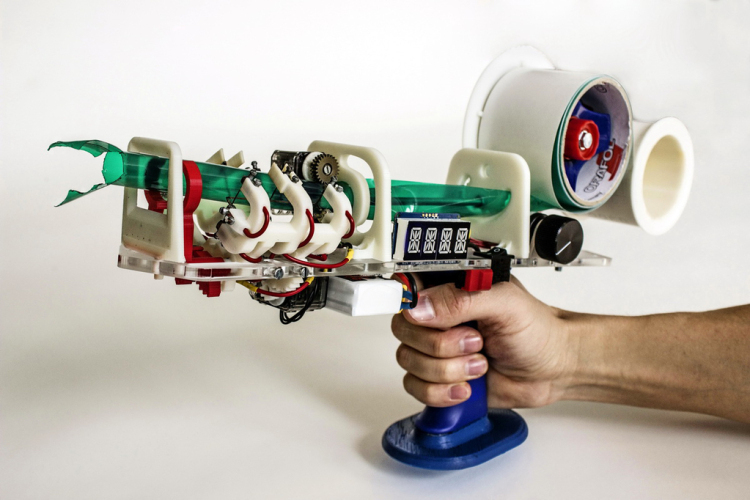 Read the published paper Protopiper: Physically Sketching Room-Sized Objects at Actual Scale here. We all need to start making a conscious effort to save energy and on the whole looking after our planet. I try not to waste energy, but I know I could probably do better. As an example, kettles consume as much energy to boil a litre of water as it takes to run your fridge for about 7 hours. Us Brits are notorious tea and coffee drinkers, using a kettle on average over four times a day. Given this vast energy consumption it would make sense to be as efficient as possible, wouldn’t it? So, why don’t we measure the water out and only boil the amount we need each time. Makes sense, but easier said than done. Typically you base the amount of water on those markings along the side for how many “cups” you are making. 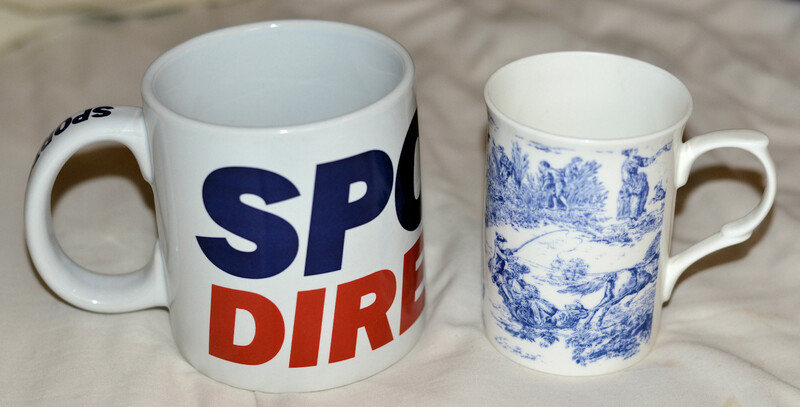 However, most people don’t drink a “cup”, they have a mug. Or in our office they tend to use jumbo mugs. Our kettle at work goes a step further and has a RGB LED indicator that stays red if the water is still hot enough so people aren’t unnecessarily (re)boiling already hot water each time, but, despite best efforts, you still always overfill it. This results in you waiting longer for it to boil and it uses more energy. Bad for you, bad for the environment. Wouldn’t it be handy (and better for the environment) if you could boil the exact amount of water you needed. Not almost the right amount, not close to the right amount, but exactly the right amount every time. Miito is the product of designer duo Nils Chudy and Jasmina Grase, and, simply put, is a rod and a base. The induction base heats the rod, which then heats the liquid surrounding it. Perfect. Once the liquid has boiled, the rod signals the base to go on standby. 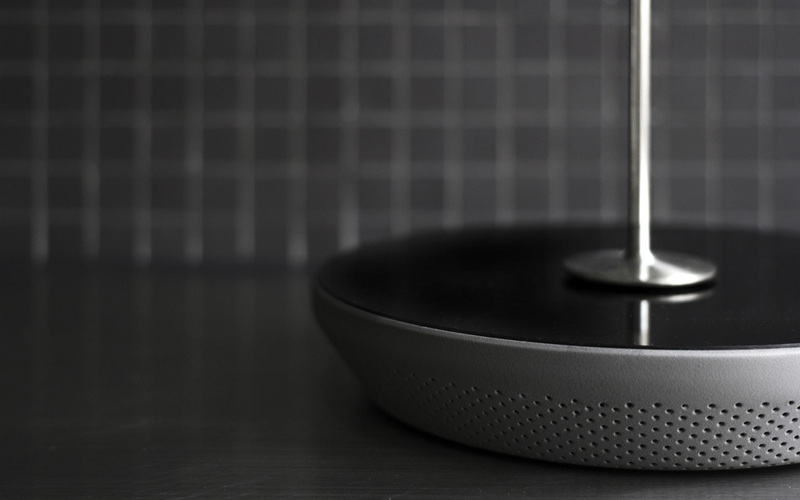 When the rod is fully placed on the base without being immersed in anything, the device shuts off. It can heat a pot of tea for when you have guests, warm the milk for your coffee, or heat your soup to less scalding temperature than your microwave manages. Lovely stuff. More information on the website here. 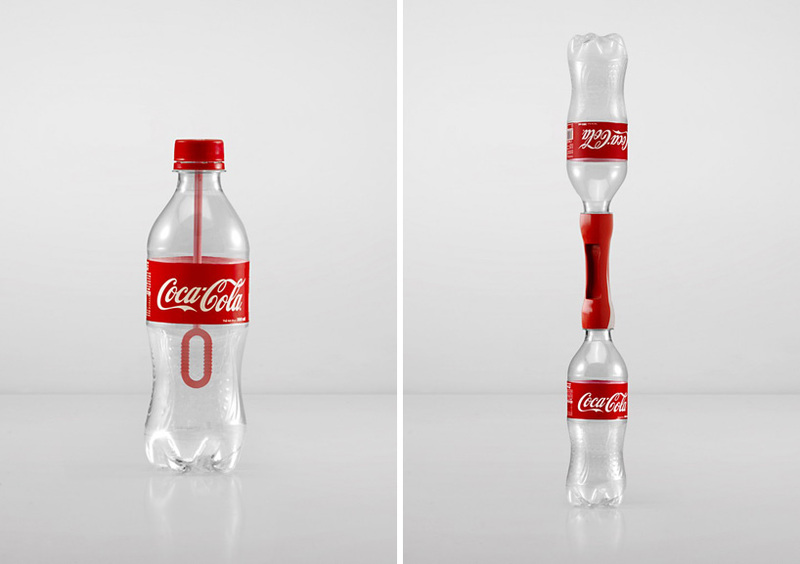 Global super brand Coca-Cola has recently joined forces with advertising agency Ogilvy & Mather in China and launched 2nd Lives as a campaign to form part of their global sustainability programme. 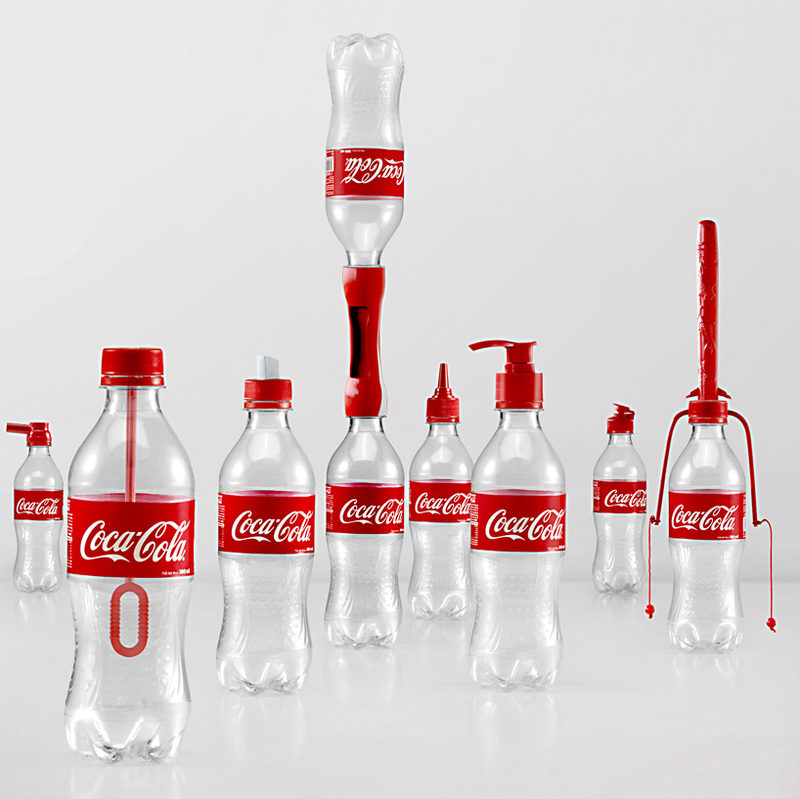 All of the 16 components represent brilliant creativity to use, re-use, and extend the life of the iconic plastic bottle that is often otherwise discarded. Yes, some people do re-use them occasionally (I remember trying to fashion my own version of a Super Soaker out of one when I was younger, never with the success of the add-on they’ve come up with now though! ), but largely the bottles are thrown away or recycled where possible. I especially like the transformation into a felt tip marker and a pencil sharpener, who doesn’t love cool stationery? The product roll out seems to be constrained only to Asia, but I’m hoping if it is a success we may see it in Europe before long. Given that there are 1.7 billion servings of Coca-Cola sold everyday the company does have at least a moral obligation to consider the materials and the full life cycle of their product package. 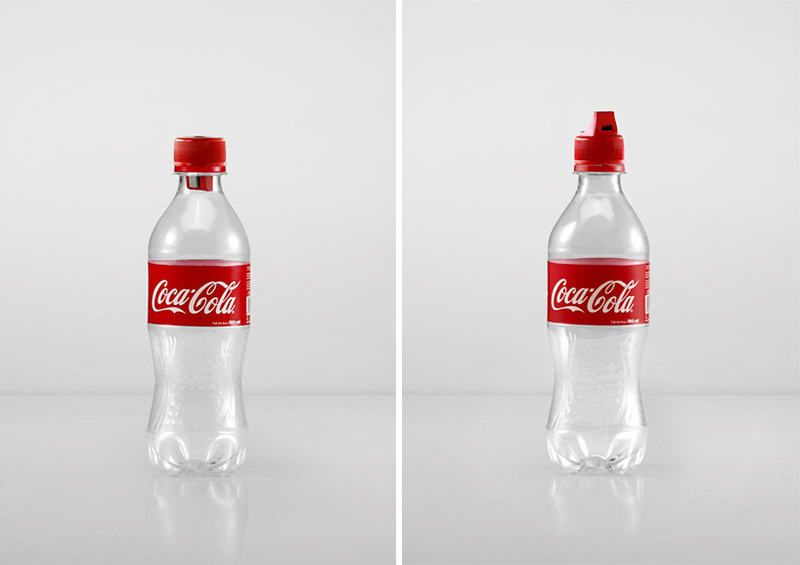 In 2009 they launched the PlantBottle made from 30% renewable materials as step towards the Cradle to Cradle approach, and by 2020 all of Coca-Cola’s PET bottles will be replaced by the PlantBottle. This has been on my blog to-do list for a while now, and have been prompted again to post it having seen the same subject on the BBC site yesterday. 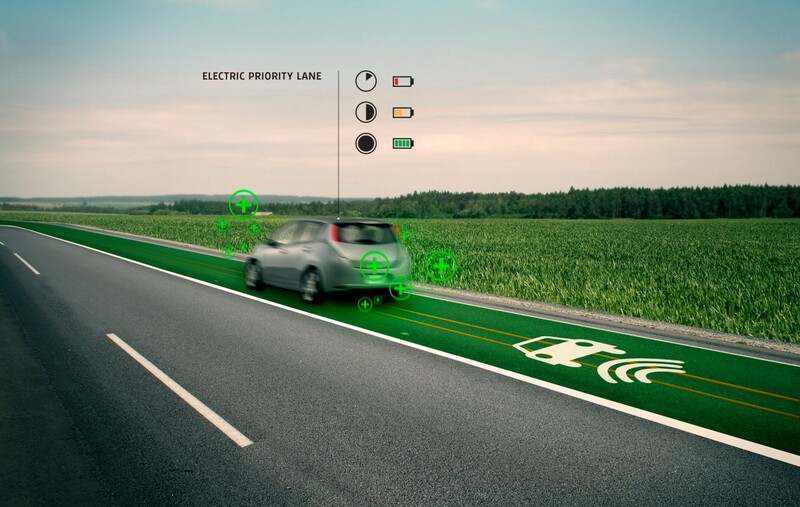 With the technology of cars advancing impressively to include all manner of smart sensors, “green” electric motors, parking assistance, and even driverless cars, none of this really matters if we don’t have suitable roads to drive on. Roads. Just a bit of tarmac laid down (relatively) smoothly with some painted lines, right? Well, yes, but why can’t we incorporate some technology into them. Improving them to adapt to traffic and weather, making them more sustainable, making them safer. Well that’s exactly what Daan Roosegaarde of Studio Roosegaard thought when he set about designing technological advances to our roads as part of a Smart Highways project. I was completely amazed that we somehow spend billions on the design and R&D of cars but somehow the roads – which actually determine the way our landscape looks like – are completely immune to that process. They are still stuck in the Middle Ages, so to speak. The first, and perhaps most obvious, upgrade to our roads is to use a phosphorescent paint for the road markings. Inspired by deep sea jelly fish it fuels the idea of a energy-neutral street, as the paint “charges up” during daylight hours and then glows throughout the night. This is ideal in rural areas where existing street lighting is minimal, and perhaps one day even removes the need for any altogether. Following on from that idea, in the colder months temperatures can drop quickly leaving drivers unaware about looming icy and inclement conditions. 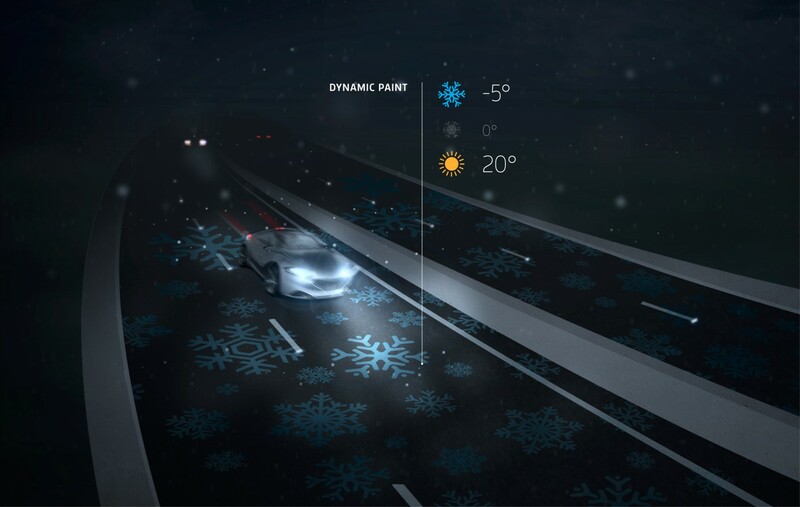 The use of a dynamic temperature-sensitive paint would provide a simple alert system to drivers by ghosting up snowflakes on the road to act as a warning system when the tarmac becomes cold enough for ice to form. In order to keep running and maintenance costs down, most of the ideas here focus on free and renewable energy resources. Linked neatly to that is wind power. At either end of tunnels large amounts of wind and air flow can circulate which is essentially wasted energy at the moment. 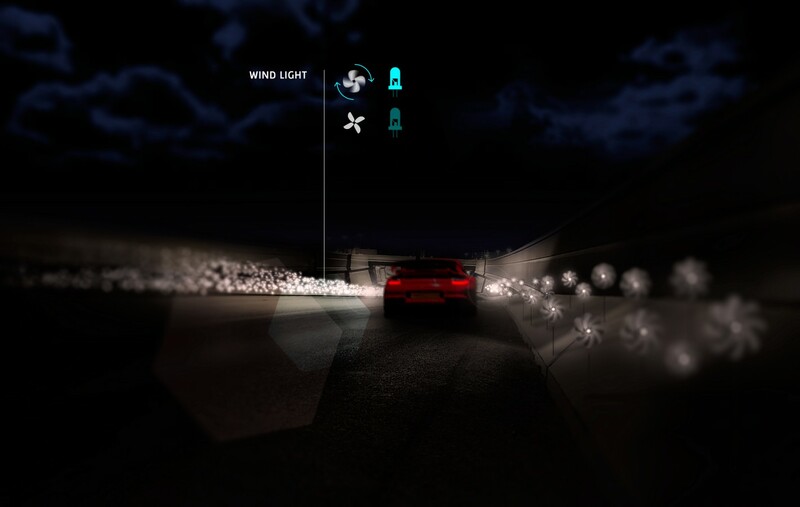 The plan is to use harness this air and, when combined with other air flows from the central reservation of cars passing in opposite directions, use it to power small turbines and further light sources for edge lighting. Similar sorts of applications are already in use on the railways (certainly in the UK anyhow). With an increasing presence of electric vehicles on the roads, the idea of an Induction Priority Lane doesn’t sound far away. The concept is to build-in coils capable of recharging electric cars as they pass overhead, extending the battery life and range of which a current electric motor and battery setup can provide. 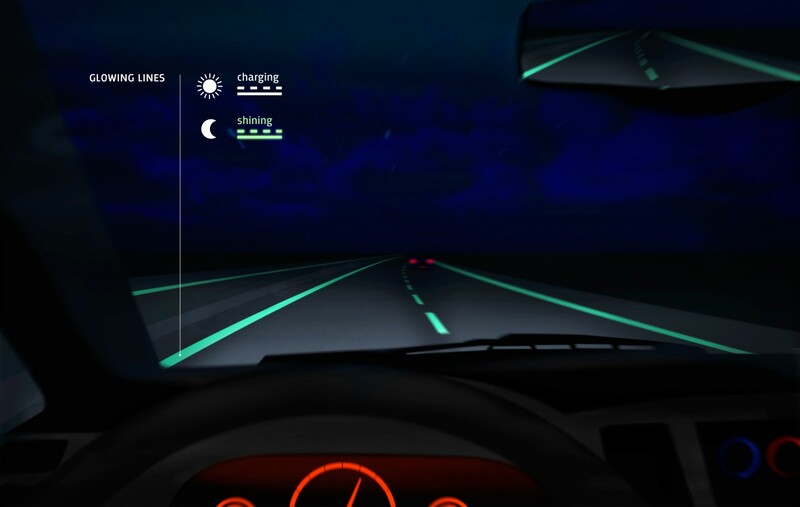 Studio Roosegaard was awarded a Best Future Concept award at the Dutch Design Awards last year, and Dutch civil works firm Heijmans has already taking the first steps in developing the concepts of using photo luminescence on the roads, making sure the cars of tomorrow have something suitable to drive on. In fact, a 137m stretch of real road, nicknamed Route 66 of the future, will feature some of these ideas later this year! Yes lots of these ideas are costly and perhaps difficult, or near-impossible, to implemented at the moment. But so is any new idea, particularly one as revolutionary as this. Roads haven’t been gradually iterated over past decades, they have essentially remained the same over a very long period of time so to break into that infrastructure is always going to be tricky. As a designer I fully commend and support the approach and ideas here, and as general members of society everyone (designer or not) should too. I think the key thing to remember here is that the suggestion isn’t for every road in the world to have these. Starting out with just major routes and motorways, and gradually trickling the technology down to commuter routes and, who knows, by that point maybe even bicycles will have been given some more consideration in this! 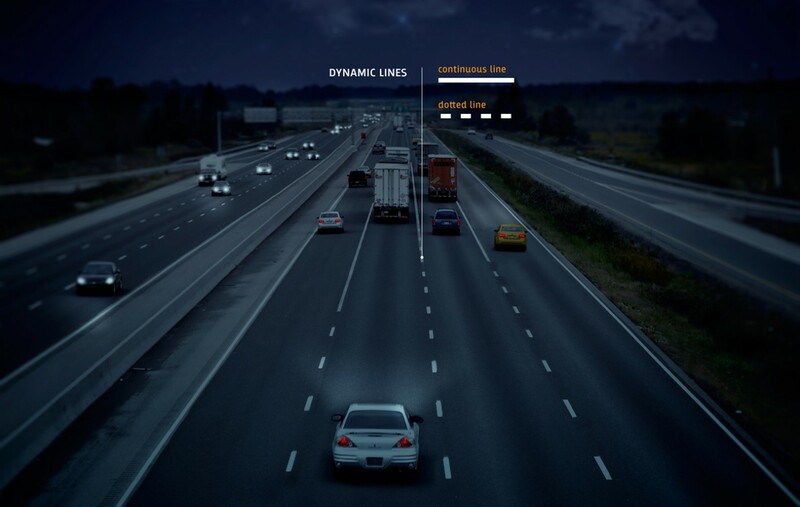 More information in a great video on the Smart Highways project here. 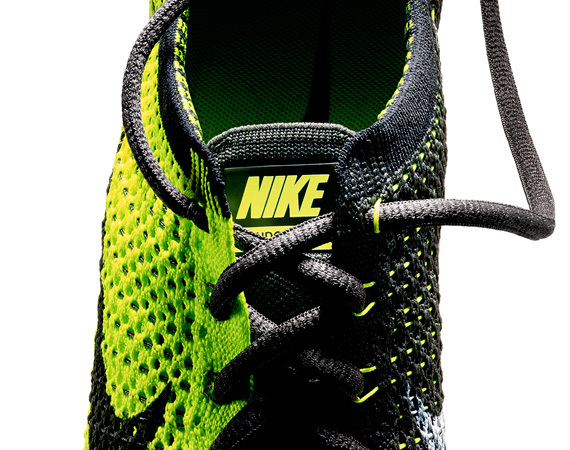 After four years of intense research and development Nikeseem to have struck gold with their new “knitted shoe”, launching just just in time for the 2012 Olympics. 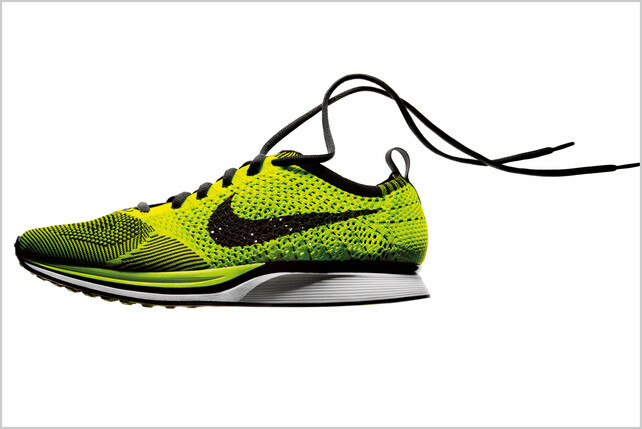 Presenting their lightest and most sustainable shoe ever, Flyknit. A single, lightweight knit upper is the result of intricately detailed patterns of yarn inter-woven with Nike’s trademark Flywire for additional support. What’s really striking about this design is the collaborative nature in which it all came together. Since no manufacturing technique for this product existed it took a diverse team of programmers, designers and engineers, amongst others, to develop the final design. This led to an “endless amount of prototypes” of varying strengths and elasticities, which were worked through alongside athletes to provide near-instant feedback. The result is, well, sock-like in construction, and by its very nature provides a snug and natural fit, capable of loosening and contracting with your foot as it flexes and bends with your gait. The construction of the final product makes it particularly sustainable, as well as performance driven. 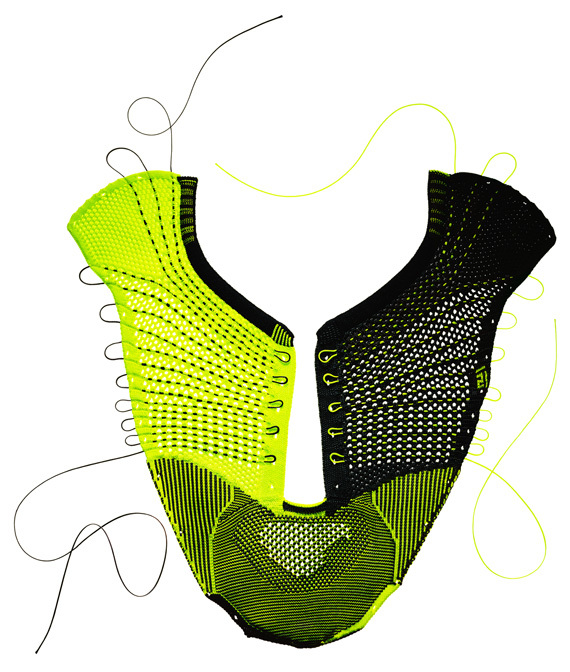 The single knitted component layer removes the need for cutting out material, and the associated waste, as well as any stitching, glueing, or other joining method which reduces both consumption and cost. The Flyknit is almost a fifth lighter than Nike’s previous marathon-winning trainer, the Zoom Streak 3, and it provides ideal opportunity for colour customisation by the US, the UK, Kenya, and Russia, whose athletes will be wearing them in this year’s Olympic Marathon. If you manage to get your hands (or feet!) on a pair – happy running! British Summer Time has officially ended and, whether you agree with it or not (the subject of many a recent debate), our clocks have recently been pushed back an hour. This gives us ever so slightly more light in the mornings to wake up to, but considerably less in the evening when travelling (cycling) back from the office. It may have been a struggle for you getting up this morning, or even coming home with it much darker than usual, but spare a thought for the town of Svalbard in Norway, the northern most town in the world. It’s dark, continuously for 11 weeks at a time as the sun sits 12° below the horizon (known as polar night) – as far as natural light is concerned, there is none. Not sure whether it’s 11am or 11pm? Just head to the local shop, if it’s open then it’s am, if not then you can go back to bed because it’s pm. Being in the lighting industry I’m well aware of the manner in which light, natural or otherwise, can play and influence your body’s rhythms, emotions, and physical well being. Our body clocks are extremely sensitive and adaptable to light. Cue Philips to tackle this ever-dark arctic town with an island-wide experiment to all use their Wake-up light to “wash out the sleep hormones” and overcome “sleep inertia” to ease you into your day. After just two weeks 78% found it easier to get up in the morning, and after four weeks that figure was up to 86%! A similarly high 87% felt more refreshed and ready for their day, with 86% reporting a positive impact on their mood. Full details on the site here. As I work in the lighting industry I tend to keep a close eye on new technologies, more efficient ways of using light and working to meet increasingly ‘green’ needs. So when such a novel lighting solution found it’s way into my inbox it really caught my eye. 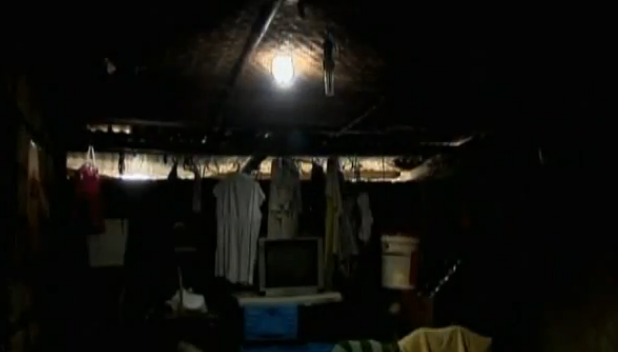 A bottle of water with a few drops of bleach is all it takes to provide a lighting solution to the light-deprived slums of the Philippines. The mere simplicity of it is staggering. Nature at it’s finest being exploited for those that need it, spreading sunlight throughout places that rarely see it. It is almost like taking a step backwards in terms of pushing new technology, but really this is the kind of thinking and innovation that we should be embracing. 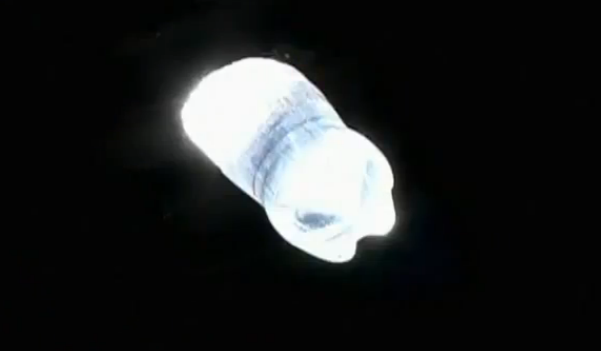 Designed to emit clear light for around five years, it is incredibly sustainable. Just watch the video and you’ll see what I mean. The simplest of solutions, the most cost effective of products, and all developed to aid some of the world’s poorest people. Light can have an incredible effect on state of mind, motivation, circadian rhythms and general health as a whole. This simple product will really benefit the entire community, and bringing it to people who have little or no money, or even electricity, is a fantastic solution. Two very enthusiastic thumbs up.